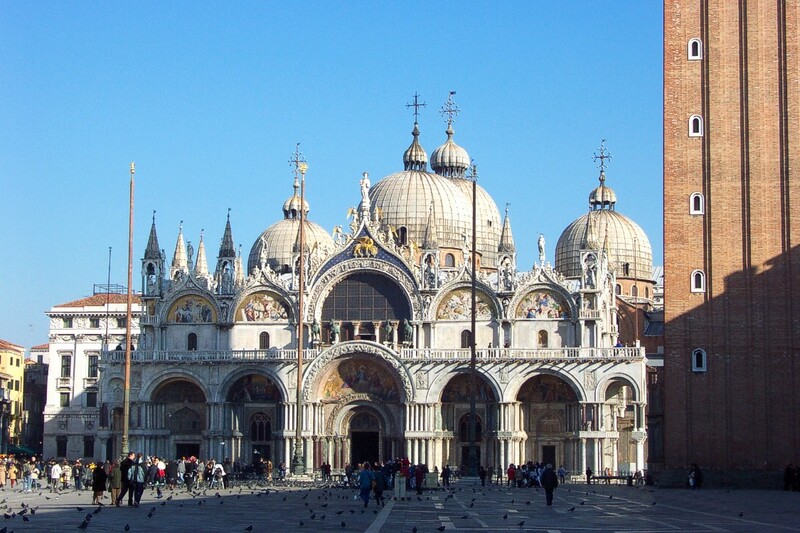 From Padua you can reach Venice in only 27 minutes by train. It costs 3.55 € one way. 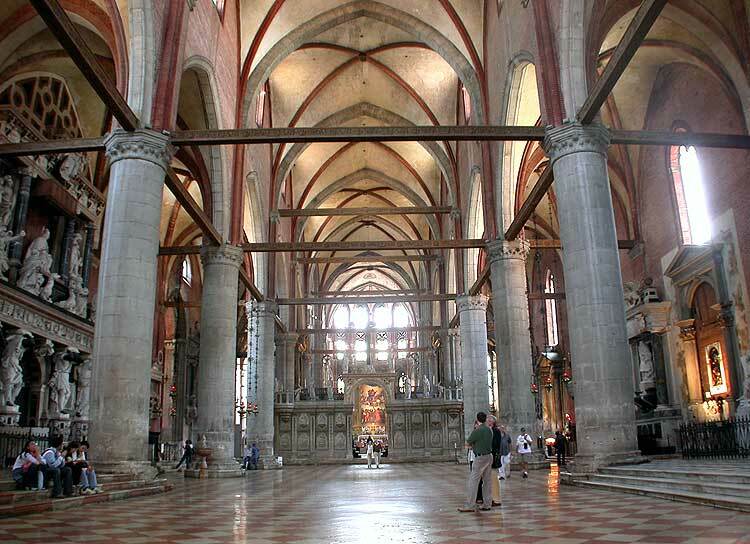 This basilica was erected between 1236 and 1338 through the efforts of the Conventual Franciscan Friars Minor. Tt was replaced by a grandiose Gothic Franciscan-style edifice in the 14th century, with a nave and two aisles and seven apsidal chapels. The imposing 14th century brick bell tower is one of the highest in Venice. 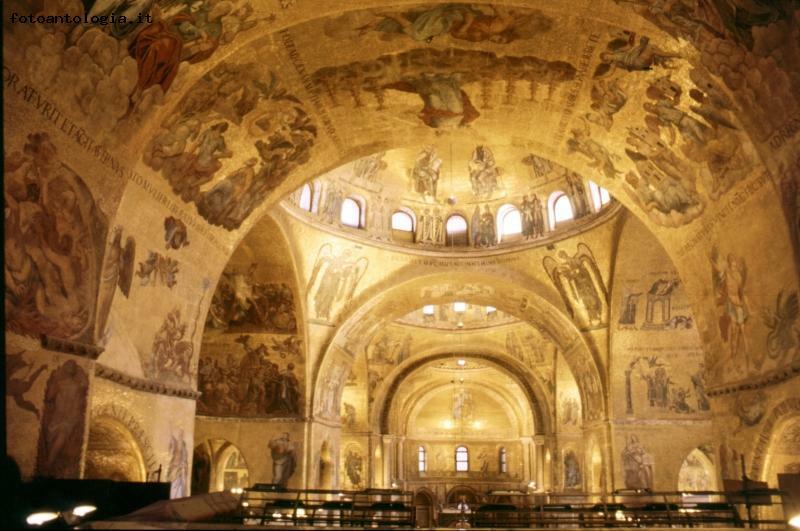 The Basilica is one of the most important sacred buildings owing to the wealth of artworks that it houses. The interior, a latin cross in plan, features precious paintings such as one of the masterpieces of Titian’s mature work, the Altarpiece of the Assumption (1516-1518), intended by the artist for the high altar. It is Venice’s only square. It consists of an artistic complex of buildings in different styles that over time have created an harmonious setting to the square. It is trapezoidal, and the Procuratie Vecchie and Procuratie Nuove run along the two extensive sides. They are known as old (‘vecchie’) and new (‘nuove’) on the basis of the age of the buildings over the arcades of the ground-level porticoes. 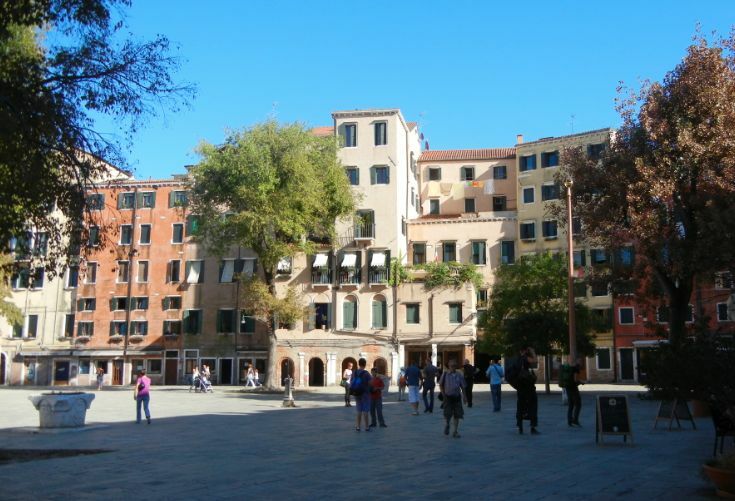 The Procuratie Vecchie runs along the north side of the square from the Clocktower and have kept their Renaissance features. They are followed by the Ala Napoleonica. This was built in 1810 by the architect Giuseppe Soli on the site of the demolished San Geminiano church, which was built Jacopo Sansovino. 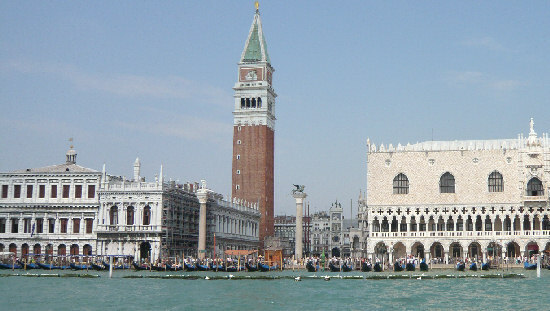 The Procuratie Nuove runs along the west side of the square and includes the Libreria di San Marco, which was designed by Jacopo Sansovino as well, at the request of the Venetian Republic, to house the codicils donated by Cardinal Bessarione. 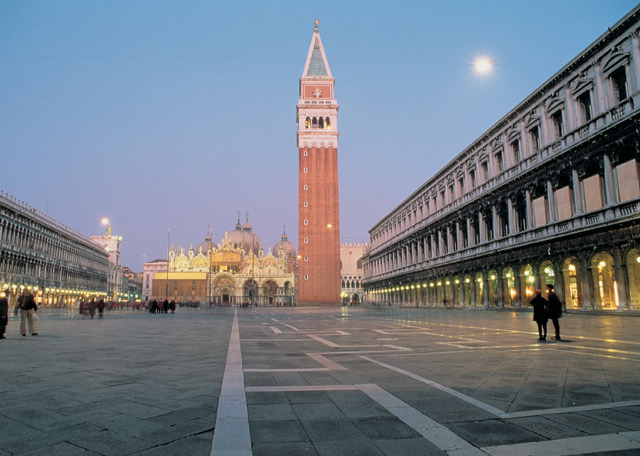 The clocktower is at the start of the Merceria, the road that leads from Saint Mark’s Square to the Campo di San Bartolomeo. The name Merceria refers to the many shops on both sides of it. The monumental estate of the Accademia Galleries is located in the prestigious centre of the Scuola Grande of Santa Maria della Carità, one of the most ancient lay fraternal orders of the city. 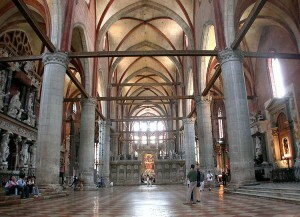 The homonymous church of Santa Maria and the monastery of the Canonici Lateranensi, built by Andrea Palladio, are integral parts of the Accademia. 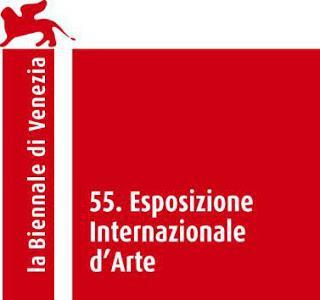 In 1630 Venice experienced an unusually devastating outbreak of the plague. 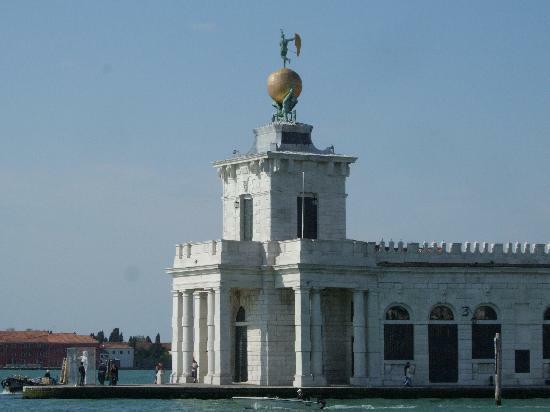 As a votive offering for the city’s deliverance from the pestilence, the Republic of Venice vowed to build and dedicate a church to Our Lady of Health (or of Deliverance, Italian: Salute). 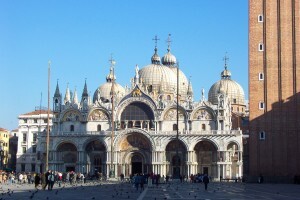 The church was designed in the baroque style by Baldassare Longhena. Construction began in 1631. Most of the objects of art housed in the church bear references to the Black Death. 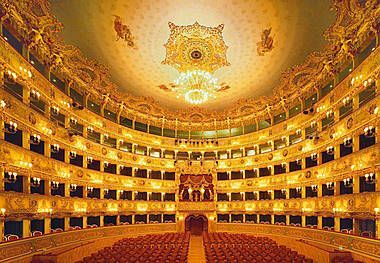 It’s among the most important museums in Italy for European and American art of the first half of the 20th century. 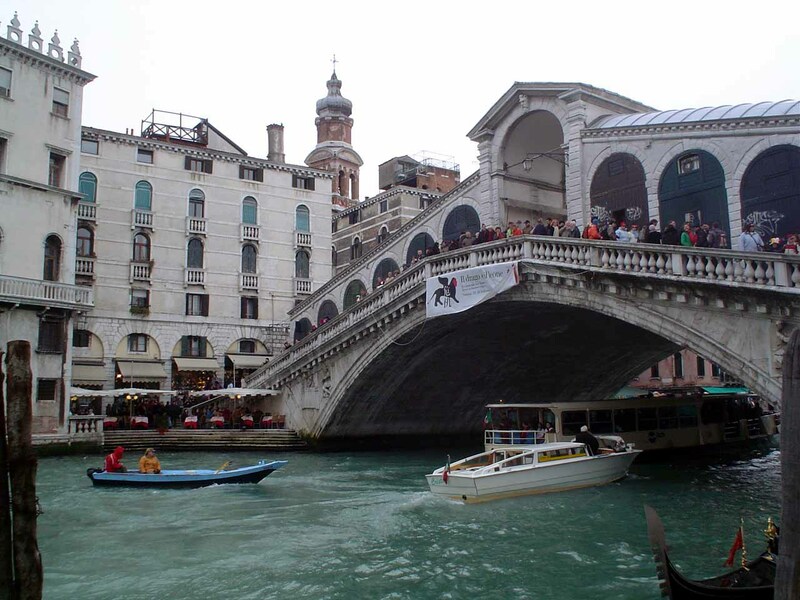 It is located in Peggy Guggenheim’s former home, Palazzo Venier dei Leoni, on the Grand Canal in Venice. The museum presents Peggy Guggenheim’s personal collection, masterpieces from the Gianni Mattioli Collection, the Nasher Sculpture Garden, as well as temporary exhibitions. The Peggy Guggenheim Collection is owned and operated by the Solomon R. Guggenheim Foundation, New York, which also operates the Solomon R. Guggenheim Museum and which is a partner of the Basque Regional Government for the programming of the Guggenheim Museum Bilbao www.guggenheim-venice.it. 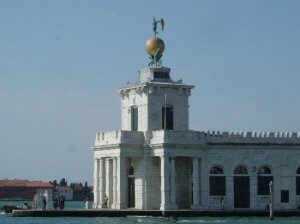 According to tradition the Arsenal of Venice was founded in 1104; it has been enlarged over the centuries, coming to occupy a large part of the northeast area of the city. The term Arsenale is a corruption of the Arab word darsina’a – a house of industry – and for centuries it was the largest in the world with over 16.000 employees at its peak when there were hundreds of galley ships in its basins, ready for war. On the wall to the right of the entranceway is a bust depicting Dante Alighieri, recalling a visit the poet made to Venice in 1321. 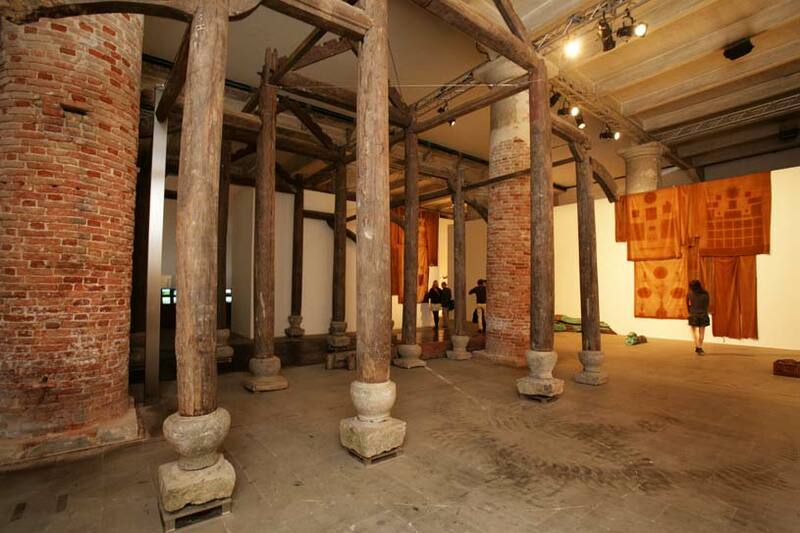 Still mainly closed to tourism, the Arsenale is sometimes used for notably important exhibitions and trade fairs.